John G. Culpepper married Rhody Ann Hannon on 6 Oct 1852 in Coosa Co., Alabama, Book B-223. Vianna Culpepper, 2, F, AL. There is due to him Fifty Four 30/.. $54.30 dollars, on account of clothing not drawn in kind. He is indebted to the Confederate States ____________ dollars, on account of extra clothing, &c.
He is indebted to ____________, laundress, at ____________ dollars. The contract price of the ration at ____________ is ____________ cents. DOB based on 1950 census, POB based on pension application. George W. Culpepper and Elizabeth Martin on 10 Jan 1859 in Harris Co., GA. Biography* � The 1860 census of Harris Co., GA appears to show Martha (Blackstone) Culpepper and three of her sons clustered together. Unfortunately, what appear to be errors by the census taker make it difficult to sort out. The head of household for family 627 (1186 Dist, P.O. Mountain Hill, p. 90) is shown as a 22 year old male, born in Georgia, who is an "operator in factory" with $50 in personal property. Unfortunately, the name of the "male" is Martin Culpepper. The other members of the household are Tabitha Culpepper--an 18 year female born in Georgia, and a 4 month old infant girl. This would suggest that it was the household of Nathan F. Culpepper and his wife, Sarah Tabitha Herren. Possibly Nathan and his wife were living in the house of Martha (Blackstone) Culpepper who was recorded living next door in the house of his brother, John Culpepper. Nathan F. Culpepper and Sarah T. Herren on 21 Apr 1858 in Harris Co., GA.
P 63 family 862 (Martha 8 AL in hh of Martha Culpepper). Obituary of Martha Byne Blackstone Culpepper (#32066), published 24 Dec 1899. P. 876, family 1110. "Lafayette cannot read or write." 1850 Census* 1 Jun 1850� Daniel listed as a household member on the 1850 Census on 1 Jun 1850 at Marshall Co., Mississippi. Francis G. Culpepper's older brother, Daniel Peek Culpepper, had died 25 Oct 1825, only a couple of months before Daniel F. Culpepper was born. Presumably Daniel was named for his uncle. Since Daniel's parents married in Monroe Co., GA in Jan 1825, this is believed to have been Daniel's place of birth. No confirmation has been found for Daniel's middle name. A grandchild was named "Daniel Fey Burgin" and it has been suggested that "Fey" was Daniel's middle name. However, Mrs. C. M. (Pat Burgin) Lee wrote 2 Nov 1994 letter that according to Daniel Fey Burgin's sister, Marie, "her brother, Fey, was named after a photographer friend of the family." Obviously the photographer wasn't around in 1825 when Daniel F. Culpepper was born. Daniel's father, Francis G. Culpepper, has not been found in Georgia land records and so it is not known at what point Daniel's parents moved the family to Talbot Co., GA where they are found in 1830 census records. In Daniel's first appearance in census records he was unfortunately listed as one of three females 0-10 years of age in the household of Francis G. Culpepper. A microfilm copy of the census record was double checked and the head of household was clearly listed as "Francis G Culpepper" and his three young sons were definitely listed in the female column. Daniel's father moved his family to Chambers Co., AL in 1834 The family was still in Chambers Co., AL in 1840 when Daniel and his two younger brothers were correctly noted in census records as 3 males 10-15 years of age in the household of Francis Culpepper. The family moved to Mississippi in 1846. No marriage record has been found for Daniel in Chambers Co., AL and it is assumed that he moved to Mississippi with his parents. Daniel was not listed with his parents in the 1850 Lafayette Co., MS census. It is not known at what point Daniel moved to Texas. Mrs. C. M. (Pat Burgin) Lee wrote 2 Nov 1994 that "according to the Culpepper Heritage Society history, Daniel & Thomas in 1848 went to Texas before the rest of the family." They have not been found in 1850 Texas census records. There was a 23 year old "Daniel Culpepper" born in South Carolina that was listed (p. 368) as a farmer in the Marshall Co., MS census in the household of Mary K. Hardin. A 22 "Thos. J. Culpepper" was also listed nearby (p. 369) in Marshall Co., MS in the household of Robert I. Greer. Thomas was also listed as having been born in South Carolina. Since Marshall Co., MS shares a border with Lafayette Co., MS and the two were apparently living on nearby farms, it seems likely that these were Francis G. Culpepper's oldest sons out on their own before setting out to Texas. Daniel was listed with a Georgia place of birth in the 1860 and 1900 census records of Lavaca Co., TX and with an Alabama place of birth in the 1870 Lavaca Co., TX census. Since Francis G. Culpepper moved his family to Texas in 1851, presumably both Daniel and Thomas would have been in Texas by then. In 1853, Daniel's grandfather, John Culpepper, wrote to Francis G. Culpepper, "I thought Daniel was gone." It is not clear what this refers to, perhaps Daniel had contemplated moving on from Lavaca Co., TX and then changed his mind. Daniel is next noted in the marriage records of Lavaca Co., TX in 1855 and at this point he apparently settled down to stay. Daniel continued to live in Lavaca County, Texas until after the 1900 census when he moved to Devine in Medina County, Texas where he died. In the 1860 Hallettsville, Lavaca Co., TX census, Daniel Culpeper and his wife, Mary, and their daughter, Martha were listed twice. In records of family #245, living next door to his father, Francis, Daniel was listed with real estate valued at $1,200 and personal property valued at $1,000. In the listing for family #644, Daniel was listed as having $600 in real estate and $1,000 in personal property. Possibly Daniel owned both pieces of land and the census taker, possibly getting information from neighbors, didn't realize that the family was being recorded twice. Or, since census takers were paid by the head, perhaps some creative record keeping was done. Daniel served in the Confederate Army during the Civil War. On p. 54 of On The Headwaters of the Lavaca and the Navidad, Paul C. Boethel listed "D. F. Culpepper, private" on the: Muster roll of Frederick J. Malone's Company, organized at Sweet Home, August 6, 1861. Enlistment for state service for twelve months. Note on roll: "No arms of an improved style." "D. F. Culpepper, Private" age 37, born Georgia, with a "Sweet Home" TX post office was listed in this reorganized company. Francis G. Culpepper, 1 M20-30, 3 F0-5 (sic), 1 F20-30. Daniel Culpepper, 23, M, Farmer, SC. Lavaca Co., TX: Daniel Culpepper and Mary Ann Guthrie, 16 Aug 1855, Book I, p. 155. Lavaca Co., TX: Daniel F. Culpepper and Mrs. Zilpha L. Holloway, 18 Sep 1872, Book II, p. 158. 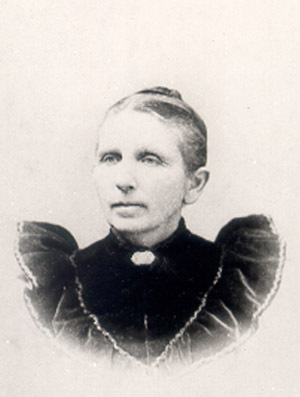 Mary Ann Culpepper was Mary Ann Guthrie, Daniel F. Culpepper's first wife and Maggie was Daniel F. Culpepper's daughter by his second wife. The close proximity of the other three graves to Mary Ann's and the dates of the children's births would suggest that they were in fact her children. Since full dates were not given on the tombstones, it is possible that the stones were placed later and dates were based on memory and it appears that the stones have weathered and some of the dates are difficult to read. However, based on the Culpepper Heritage Association records, the infant James M. Culpepper should have shown up in the Daniel F. Culpepper household in the 1860 census. As noted, although the family was listed twice in the 1860 census, James was not listed. But the fact that the family was listed TWICE suggests that the census record is flawed. Could the three graves have been for children of another Culpepper brother? Vashti (Harbour) Culpepper, the wife of Daniel's brother, William R. Culpepper, is believed to have died by Nov 1856 since she was not mentioned in the estate papers of her father. But if she was the mother of W. R. Culpepper it would seem natural that her child would have been found near her and she has not been found in this cemetery. Also, if Daniel's brother, William R. Culpepper, was the father of the child then the name on the tombstone should have indicated that this was the grave of W. R. Culpepper, JR. Since William did not remarry until 1861, He was presumably not the father of the other children. Daniel's brother, James L. Culpepper, did not marry until Dec 1856 and so presumably was not the father of W. R. Culpepper. James' first wife had apparently died by 1860 since he remarried Jan 1860. If James M. Culpepper was a child of James L. Culpepper it seems likely that the child would have been buried near his mother and Eliza Jane (Harbour) Culpepper's grave has not been found in the Mt. Olive Cemetery. Also James and his second wife, Margaret, were noted in the 1860 census and no children were listed in the household. Descendants have preserved the birth records of the children of James and Margaret and "A. Culpepper" was not listed as one of their children. This brings us back to the graves of the three children by Mary Ann (Guthrie) Culpepper. Although there is no positive evidence that they were Mary Ann's children the dates of birth and the proximity of the graves suggest that they were. 1850 Census* 1 Jun 1850� John was listed as a household member on the 1850 Census on 1 Jun 1850 at Marshall Co., Mississippi. Biography* � The "BIBLE FAMILY RECORD OF FRANCIS G. & EGLINTINE CULPEPPER" recorded J. T. J. Culpepper's birth (the day of birth was difficult to read and might be 1st): _________________________John T. J. Culpepper _________________________was Born Aug 9th 1827 However there is a notation after the record of J. T. J. Culpepper's death which reads "He was born June." In the 1900 census, he was listed as having been born Aug 1827. His tombstone in Mt. Olive Cem. lists his birth as August 8th, 1827. On p. 60 of On The Headwaters of the Lavaca and the Navidad Paul C. Boethel notes: John Thomas Jefferson Culpepper, born August 9, 1827 in Monroe County, Georgia, was the second son of Francis G. Culpepper and Eglantine Langley. The elder Culpepper with wife and thirteen children left Randolph [Chambers in 1840 census] County, Alabama, in 1846 and moved to Fayette [Lafayette in 1850 census] County, Mississippi, where they remained until 1851, when they moved on to Texas by way of Vicksburg and northern Louisiana. There were a slew of Culpeppers and many others in the party. John T. J. Culpepper and his older brother had come to Texas in 1849, and settled near the Sweet Home settlement. A second brother, William, born March 11, 1829, also settled in the area, and donated a tract of six acres for the Mt. Olive School and the Primitive Baptist Church. 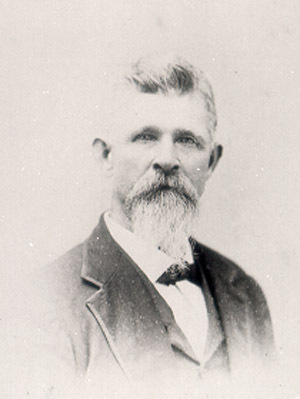 John T. J. Culpepper in 1877 led the county in two livestock classifications: (a) the largest number of horses, 86; and (b) the largest number of sheep, 2500. In the 1860 Hallettsville, Lavaca Co., AL census, "John Culpeper" was listed with his wife and young family. He was listed as having real estate valued at $1,500 and personal property valued at $5,000. Mrs. Travis (Jacqueline Lorenz) McClinton noted on the Shadrack Guthrie descendant list that John Thomas Jefferson was "1st sgt. Frederick J. Melone's Company Conf. Army 6 Aug 1861 for 12 months." On p. 54 of On The Headwaters of the Lavaca and the Navidad Paul C. Boethel includes: Muster roll of [Captain] Frederick J. Malone's Company, organized at Sweet Home, August 6, 1861. Enlistment for state service for twelve months. Note on roll: "No arms of an improved style." On p. 55 of On The Headwaters of the Lavaca and the Navidad Paul C. Boethel noted As military units for service in the Confederate army were recruited, the personnel of Searcy's and Malone's companies were sorely depleted and eventually the units were disbanded to be superseded by other state service units. Dr. Charles L. Culpepper, Sr. wrote 4 Jul 1978: My father John Thomas Jefferson Culpepper, second son of F. G. Culpepper, was married twice. His first wife had 13 children... , and my mother had eight children. Thos J. Culpepper, 22, M, Farmer, SC. Lavaca Co., TX: John T. J. Culpepper and Cyntha Ann Guthrie, 24 Jan 1855, Book I, p. 127. Lavaca Co., TX: J. T. J. Culpepper and Mary Carry Currington, 3 Aug 1882, Book II, p. 565. M.C. Culpepper Wilson County Texas, Post office Floresville. Application first filed June 29, 1917, was rejected because she owned too much and doesn't show the amount. But when law changed and she was accepted shows her homestead property as $1300.00 and $560 for personal property is owned by children. She finally started receiving it in 1925. Mrs. M.C. Culpepper states she is the widow of J.T.J. Culpepper who died 1st August 1902 in the county of Lavaca, Texas. She married him 3 August 1882 in the county of Lavaca County Texas. Her age was 58 years past, born in Alabama, Covington County, Resided in Texas since 1878. Resided 14 years, P.O. address Floresville, Texas. Say's her husband never drew a pension. He died 1 Aug 1902. She state's her husband's full name as; John Thomas Jefferson Culpepper. .
M.C. Culpepper died in the home of her daughter, Mrs. R.M. Hunt (Martha Ann Culpepper) 23 April 1930 in Karnes County Texas who's original county was Wilson. The records show that J.T.J. Culpepper, sgt., Co. F, 8 (Terry's) Regt. 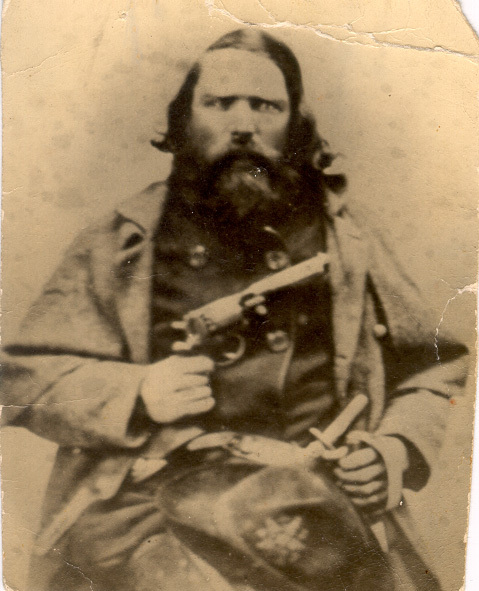 Texas Cav., C.S.A., enlisted Aug. 24, 1861, in Lavaca Co., Texas, and on roll dated Feb. 29, 1864, last on file, was reported present, slightly wounded. No later record found. William Culpeper was listed in the 1860 census of Hallettsville, Lavaca Co., TX. His first wife, Vashti Harbour, is believed to have died before 1857 and there is no record of another marriage until 1861 so the 26 year old "Mary Culpeper" born in Georgia who was listed with William in the 1860 census has not been identified. William had real estate valued at $1,000 and personal property valued at $300. On p. 54 of On the Headwaters of the Lavaca and the Navidad Paul C. Boethel notes "W. R. Culpepper, private" on the: Muster roll of Frederick J. Malone's Company, organized at Sweet Home, August 6, 1861. Enlistment for state service for twelve months. Note on roll: "No arms of an improved style." William's older brother, J. T. J. Culpepper was listed as "1st sergeant" in the same unit. On p. 55, Judge Boethel notes: As military units for service in the Confederate army were recruited, the personnel of Searcy's and Malone's companies were sorely depleted and eventually the units were disbanded to be superceded by other state service units. Apparently William later served in Company B, Hardeman's TX Cavalry. On p. 60, Judge Boethel notes: William, born March 11, 1829, also settled in the area [near Sweet Home], and donated a tract of six acres for the Mt. Olive School and the Primitive Baptist Church. Lavaca Co., TX: William Culpepper and Vashti Harbor, 20 Dec 1855, Book I, p. 135.
p 99 not mentioned in father's estate settlement 24 Nov 1856. Mary Culpepper, 26, F, GA.
William R. Culpepper and Julia Haynes married 26 Feb 1861 in Lavaca Co., TX, Book II, p. 70. Photographed* say 1900� She was photographed say 1900 at Lavaca Co., Texas. Martha's parents were noted in the 1830 census records of Talbot, Co., GA and this is where she is presumed to have been born. However, according to an article about Francis Gillespie Culpepper, in the 2 Feb 1898 Shiner Gazette he moved family to Albama in 1834 and this is where Martha would have spent her childhood. Again according to the Shiner Gazette article, Francis G. Culpepper moved his family to Lafayette Co., MS in 1846. Martha is noted in the 1850 census of Lafayette Co., MS living with her parents. Martha accompanied the Francis G. Culpepper family to Lavaca Co., TX and it is there that she married her first husband, William D. Guthrie in 1853. Martha was noted living with William Guthrie in 1860 Lavaca Co., TX census records. Martha Annie Elizabeth was noted with her second husband, Marion Guthrie, and children in 1870, 1880 and 1900 Lavaca Co., TX census records. Some time after the 1900 census, Martha and her husband apparently moved to Baylor Co., TX and they were noted living there in 1910 census records. Martha and S. M. Guthrie were listed as having been married 48 years and Martha was listed as having had seven children, all of whom were still living in 1910. Only six have been accounted for. Keith Guthrie wrote 1 Dec 1990: Her son, William F. Guthrie married Kate (Molly) Edgar and they left Goliad County due to boll worms (cotton and moved to Wichita County [TX]. Martha Ann followed them in her retiring years and is buried in Beaver Creek Cemetery near the farm that William F. worked. Baylor County Historical Society, Salt Pork to Sirloin: The History of Baylor Co. TX 1878-1930, Nortex Offset Publications, 1972. S. M. Guthrie Jr. Family. Biography* � Keith Guthrie wrote Feb 1991: I don't know a great deal about William D. and Martha Ann except that they farmed and ranched in teh Sweet Home area. My dad had only vague memories of his grandparents, mainly that they arrived by train at Norman to visit the W. F. Guthrie home. I suspect that the kids paid more attention to the train than they did their grandparents. On p. 60 of On The Headwaters of the Lavaca and the Navidad Paul C. Boethel noted: Another Guthrie in the Sweet Home vivinity whose family history is mixed also with the Culpeppers was that of Orin Guthrie. Guthrie, a Primitive Baptist minister, and wife, Eliza Davis, were among the first colonists of DeWitt's settlement and it is said the wife rode horseback with a child in her lap most of the way from Kentucky. Their first house was on the Guadalupe, but the following the sacking of Gonzales in 1836, they settled on the Upper Lavaca. There they lived until the death of Guthrie. Besides a son, William D., four daughters survived him, all of whom married men prominent in the history of Sweet Home. Cynthia, who married John Thomas Jefferson Culpepper; Mary Ann, who married J. F. Culpepper; Jane, who married Westly F. Vick; Eliza Ann, who married William Vick. The widow Guthrie married John McKinney, the high sheriff of Lavaca County, in 1854. Mrs. James L. (Vivian Hastings) Culpepper wrote in a 13 Apr 1978 letter: William Guthrie (born 1831) was the son of the Primitive Baptist pastor, Oren Guthrie and wife Eliza who came from Kentucky to DeWitt settlement, with some of the early colonists up near Gonzales on the Guadalupe River. Preacher Guthrie died in 1854, soon after he was chosen pastor of the Mt. Olive Church and is buried in the cemetery there. E-mail written 2000 to Lew Griffin from Pamela Ingle. Paul Boethel wrote on p. 78 of the History of Lavaca County that Shadrack Marion Guthrie enlisted 1863 served in Louisiana, Arkansas, and Missouri and on the border of Kansas. He participated in the battles of Mansfield, Pleasant Hill, Camden and Jenkins Ferry. Photographed* say 1900� He was photographed say 1900 at Lavaca Co., Texas. Based on census records and information from descendants, S. M. Guthrie was born in Bowling Green, Warren Co., KY. \Mrs. Travis (Jacqueline Lorenz) McClinton noted on a Shadrack Guthrie descendant list that "Emily Daniel" gave Shadrack's place of birth "Bowling Green. "\ The Guthrie family moved to Lavaca Co., TX where he met and married the the widow, Martha Ann Elizabeth (Culpepper) Guthrie in 1861.